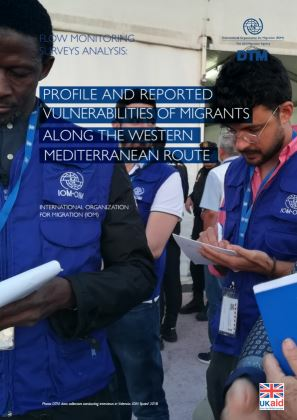 DTM team interviewed 1,341 migrants and refugees in Spain between July and October 2018. 89 per cent of respondents were male and 11 per cent female. Majority of respondents were nationals of Guinea (30%), Mali (21%), Cote d’Ivoire (11%), Senegal (6%) and Cameroon (8%). 48 per cent of all respondents answered yes to at least one of the five questions on human trafficking, exploitation and abuse based on their own experience (49% positive responses among adult males and 40% among adult females). 21 per cent of interviewees responded positively to at least 2 out of 5 indicators of human trafficking, abuse and exploitation (22% among adult males, 12% among adult females).